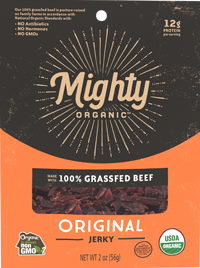 We are working to get Mighty Organic 100% grassfed beef snacks into stores near you, but we need your help. Download this form and take it to the manager of your favorite store to help spread the word about Mighty Organic and get more convenient snacks in your own backyard! Thanks for visiting us! If you have any questions, comments or concerns—or if you just want to say hi—please use the form below. We've received your message, and we'll get back to you as soon as we can.